Tom and I have decided to submit another proposal to the NSF in January. This one is an application for a grant through the MRI program to purchase a multibeam sonar/ADCP (acoustic Doppler current profiler) system to support educational and research activities on Lake Champlain. The multibeam sonar is a real-time swath-mapping acoustic tool that can do extremely detailed bottom mapping – much better than the side-scan sonar we currently use. It gathers data 70 degrees on either side of the boat within 0.25 – 1.0 m horizontal cells and 2-10 cm in the vertical! As its name suggests, multibeam sonar works by bouncing multiple sonar beams off the area being surveyed. As educators, we hope to upgrade the technology and investigative programs we can provide to students in the region. And as researchers we have been slowly changing the focus of our work, from large-scale systems to medium- and small-scale sediment and circulation dynamics. In these smaller systems, even the best bottom bathymetry that we have now is lacking, because it’s based on track-line measurements taken more than 150 meters apart. That’s better than the old lead-line data, but not good enough to produce the detail needed for today’s geodynamic research. For example, our current instruments just can’t capture the deep circulation in the lake around and over sediment drifts, underwater slumps and landslides (which we are seeing more often), subsurface terraces and river channels, fine details of the many pock marks around Burlington and Cumberland Head, sediment furrows, and countless other features. 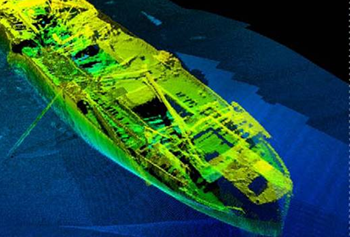 Multibeam sonar can capture an astounding level of detail! 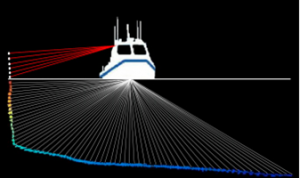 The multibeam instrument is capable of collecting vastly improved bottom bathymetry that would benefit many other lake researchers in the region, so we hope to recruit our colleagues’ support for this proposal. The ADCP provides a quick and reliable look at the currents every few seconds. It can collect water-velocity data from ~1 meter below the sensor to depths of up to 70 meters every 1 meter (sometimes less) in the vertical – while the vessel is moving!